When you look back at your ancestry, it’s hard to know what people were like when you don’t have anyone to tell you their stories. One overarching theme on both sides of my family I can discern is that their lives were impacted by war. The picture above is from my Dad’s side. One great grandfather (left) served in WWI in France for 15 months and was wounded twice, then confined to an army hospital for several months. The other (middle) also served in WWI in the cavalry. My grandfather (right) was in the service during WWII. My Dad then enlisted in the Marines Corps reserves during the Vietnam War, getting proper training vs leaving it up to chance in getting drafted with poor training. Luckily he never had to serve overseas. He recalls in his family, involvement in the military was out of sense of duty. His grandfathers and father then continued that sense of duty in successful careers as a head of a glass cutting union , a Sheriff and a sales manager and secretary of a manufacturing company. I can remember my maternal Grandfather talking about his experience in WWII, although I was too young to appreciate or take note of it at the time. Above are the dog tags he wore as well as the locket he bought for my grandmother while he was away for 3 years in North Africa and Europe. My Mom was two weeks old when he left and 3 years old when she really met her father for the first time. 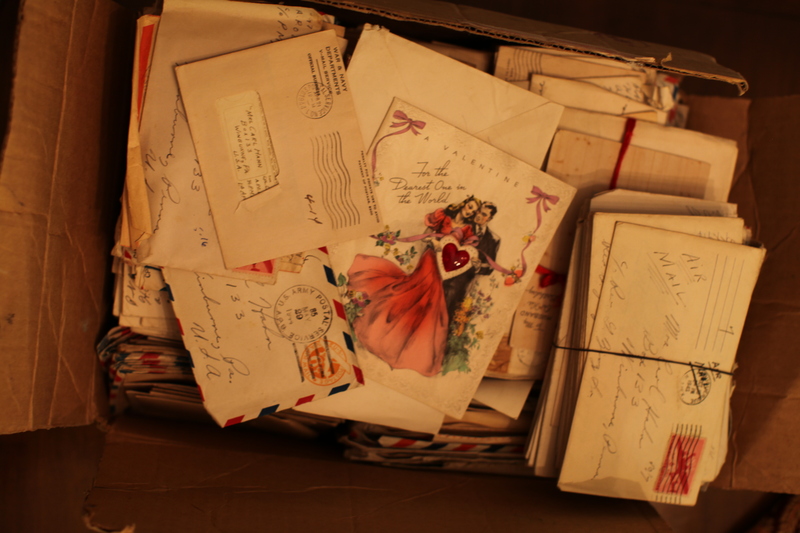 The most amazing artifact we still have of any from our ancestors are all the letters my grandparents wrote to each other during WWII. Hundreds of them from 3 years of separation and not knowing if they’d ever see each other again. In many, life simply went on about its business. I’ve barely scratched the surface, but it is incredible to read my grandfather asking about my infant mother and professing how happy he was to have a girl. While it was too difficult for him to show it in his life, it was obvious he loved her very much. Lucky for me, my family came out unscathed. I try to imagine what I would do in their situations. I’m lucky my husband works in advertising and I need to remind myself when he often is on the road now that it could be much worse. I wonder also what effects of living with war in the way my ancestors did has made its way to me. I would say the importance of family and making the most of the time you have together is one. A sense of character would be another. My Mom just stepped back in the room and said I’m a fighter. Maybe not in the warrior sense of the word but I guess she’s right. Overall, I’d say when it comes to war I’d like to hope there are other means that will be on the table we can employ to achieve peace and prosperity moving forward. You are currently reading family, love and War at 52 To Do.